 Home  History  What Is It Good For? School was perhaps partly to blame. We were taught all about the First and Second World Wars. I was never very good at Maths or English, and during my Middle School years I had to go to “special needs” classes in these subjects. I’ve no idea now what the other kids were doing during the time we were in these classes, perhaps because, whilst it was rather humiliating being in such a category, I actually rather enjoyed these lessons. They were an escape from the norm. We were moved around a bit as these classes were held in various empty classrooms across the school. For a time we had our extra English lessons in the small room which was the school library. I liked this room, it had a carpet and was usually warm and cosy, unlike most of the classrooms. One of my friends and I found a series of books in the library which were about pilots – they were quite old books, old fashioned perhaps, rather than old-old. I can only remember the titles of two of them: ‘Spitfire Pilot’ and ‘Spy Plane Pilot’ – but these two pretty much sum up the kind of stories the series told. Our teacher was visibly delighted because here was a set of books which we’d voluntarily chosen ourselves, and which, at long last, we actually wanted to read! I devoured ‘Spitfire Pilot’ and I was part way through ‘Spy Plane Pilot’ when the Head Teacher decided to look in on one of our lessons. She was horrified to find what kind of reading matter we were so wholly engrossed in. Not only were the books instantly removed from our lesson they were immediately withdrawn from the library and got rid of completely. At first I was devastated and then slowly incensed. Our teacher was similarly dismayed. She’d tried to reason with the Head that it wasn’t so much what we were reading but the fact that we were reading which really counted, but it didn’t wash with the Head. The books had to go. I never did find out how the night mission to fly a Lysander deep behind enemy lines in ‘Spy Plane Pilot’ ended. All the characters have remained “M.I.A.” (Missing In Action) ever since. Unwittingly though, the Head had simply spurred our imaginations even further, as we acted out in the playground all the scenarios we could dream up of how the story might have ended. Looking back I now realise I learnt a deeper lesson here. The reason I was so incensed was the fact that the Head had destroyed the books without her having read them. Clearly she’d judged a book by its cover. How could she understand what they were about without actually reading them? We knew war was not a good thing. I used to quiz my grandparents about their experiences in the War, and they made it very clear war was bad. But that didn’t stop it from being exciting. Plus, there was another level to this fascination which was rooted entirely in the technical. Most of the books, toys and models I had at home about the military and warfare were essentially about machines – tanks, aircraft, ships, weapons, and that kind of thing. 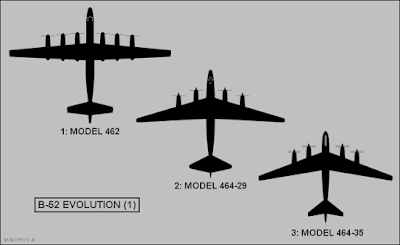 Learning to distinguish various types of aircraft from the shapes of their silhouettes or their markings, what roles and purposes they performed in combat required hours of patient study and were translated into tests of memory which my friends and I compared with one another in our playground games. At the time I thought I was interested in war, but I wasn’t. I thought I was interested in the military, hence why when I grew up I thought wanted to join the Army and become a soldier, surely that’s why I avidly watched so many war films, as well as episodes of Dad’s Army, Hogan’s Heroes, The Phil Silvers Show, and A Fairly Secret Army. But, as time went by I came to realise I wasn’t really interested in war at all, I was actually fascinated by history instead. One of the key ways in which children learn is by empathy. Play is often a form of mimesis through which children internalise and process certain types of information. At that age I wasn’t any good at book learning, but I had a full and vivid imagination. This is why when we had to write stories I always preferred to draw rather than write what was in my imagination. I might have had to have extra Maths and English lessons, but I never failed to get top marks in Art lessons. I’m not sure how or when I began to realise that it was the history of the two World Wars, rather than warfare itself, which really fascinated me. I’d certainly been captivated by other periods of history, such as the Great Fire of London, which we’d studied prior to studying the World Wars. It may have been when we moved on to study the Industrial Revolution which set the contrast into play. I hated this topic. I realise now that what I really hated was the way in which it was presented in the classroom. Oddly enough types of weaving loom and smelting machines didn’t equate or inspire in terms of typologies in quite the same way as Spitfires, Messerschmitts, and Lancaster bombers had previously captivated my imagination. Rote facts and figures are one thing, but what purpose such facts can inform is another altogether. At that age battle stats top trumped economic history entirely. 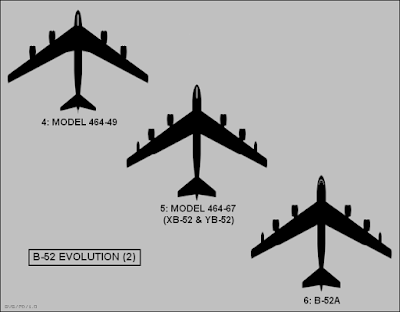 These reflections were prompted when I read a recent article on the B-52 or ‘Stratofortress’, the long range heavy bomber which was developed by the United States Air Force shortly after the end of the Second World War. The article (which you can read here)* was essentially written as an homage to the technical longevity of this great behemoth of the skies. It’s an aircraft which defines the sense of threat, menace and foreboding that characterised the Cold War era. Yet the thrust of the article was also one which rather curiously celebrated this aircraft and its destructive power in a way which, as I read it, I found alarmingly tub-thumping. Admittedly, it’s a piece of Sunday Supplement journalism – but reading it I found myself baffled. As a eulogy it was only slightly tempered by an acknowledgement of the death and destruction these seemingly ancient aircraft have wrought in various far flung parts of the globe. 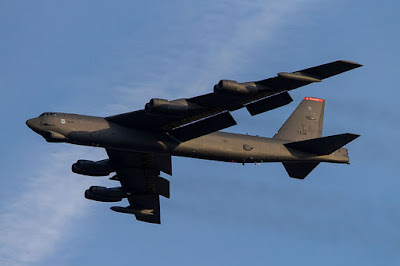 Instead, leaving it to a few carefully selected “quotes from the public” to leaven the snappy gung-ho soundbites from serving and former B-52 crews. 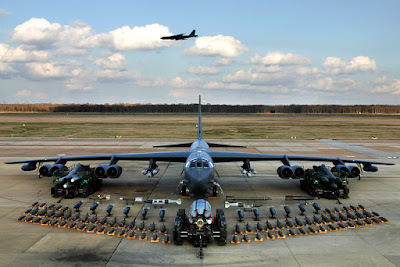 For example … When a B-52 turns up, looming darkly over the horizon, you can be sure someone down on the ground is “going to have a bad day.” B-52s are the “sharp end of the spear.” They have such a far reaching range that the aircrews can go on continuous 48 hour missions, kissing their families goodbye on the doorstep and returning home after a successful sortie, circumnavigating the earth, as if they’d never been out of their home country let alone deployed on active service like the ground troops on the frontline whom they are supporting, it’s all just another, albeit it very long, day at the office. Such is the mechanisation of death. Removing the combatant from reality. Altering the psychological dynamic, like operating drones only with a bit more adrenaline and personal discomfort. It was the sentiments betrayed in these quotes, the ‘disconnect’, which really ticked my unease. I think this is what I realised as I was growing up. The reality of what warfare actually means to those not engaged in active service. Those without the guns but still on the ground and immovably in harm’s way. Bombs dropped from 50,000 feet do not discriminate. And ‘smart bombs’ aren’t necessarily any more discerning. It was about this time, when I was in High School, watching the daily news reports during the first Gulf War, when so-called ‘smart bombs’ were first showcased to the world, that I recall watching one of those blurry videos shot from the nose of a guided missile. It was targeting a strategically located bridge somewhere in Iraq which needed to be “taken out,” and pointing to the TV screen with his pencil the US commander giving the Press briefing quipped that a blurred human figure running from a car on the bridge was the “luckiest man in Iraq” as the missile zeroed in on his car and he was engulfed in the ensuing smoke as he made it to the edge of the screen and presumably (we hope) survived the blast. It was around this time too that the Berlin Wall collapsed and the immense threat of the Cold War era finally came to an end. A new sense of freedom (freiheit) and hope for the future filled Europe. In my mind, back then, the world seemed set on an unalterable trajectory for the better. I had an unconsciously Whiggish assumption that this was the progression towards the future to which all humankind had been aspiring since the defeat of Nazi facism. The world was going to be a great place to be an adult in. I couldn’t believe my luck. Thank God. No need for National Service. No fear of being drafted to fight in some God awful war like all those poor, unfortunate generations who had gone before. But what became of all that? I can’t bear listening to the News today, let alone looking at images of it. I worry about what’s happening and how it is being framed by many politicians and many parts of the media alike. It’s a circus of hype which fosters and encourages these insecurities. I don’t believe wars are inevitable or always necessary. In fact, I feel the majority of wars are totally unnecessary. They are not always black and white situations. Defence is of course legitimate, anyone who faced the Nazi onslaught of the Second World War can amply provide justified examples of that, but it seems to me that assessing the threat today isn’t always quite as clear cut. So much for that brotherhood of man and the New Europe, I thought! If, on one level, war is simply a matter of logic, death and destruction are inevitable. It stands to reason. But what baffled me about my exchange partner’s response was the element of feeling. How could you shoot someone you knew was good simply because the situation was bad and dictated it as a necessity? Surely sense could prevail? I know you / You know me. We know this is wrong. Hence we don’t have to do this. But such is the conflict of macro- versus micro- agency. Yet now, in this current time, when we are all more connected and more in direct communication with one another than ever before, surely this can count for something better and more rational? Certainly, I have more friends dotted about the globe than anyone in the generations of my family that have preceded me. If something happens in a country where I know someone who is actually living there I can ask them what is going on. This was brought home to me shortly after the big earthquake in Japan in March 2011. I was in Japan when this occurred, but a few days later I had to go to Korea for a short work trip before returning to Japan. On those two evenings I was in Korea I watched the rolling 24 hour news reports on TV in my hotel room and found myself becoming increasingly anxious about what was being reported from Japan; but somehow it didn’t seem to fit. The TV reports differed from what I’d experienced in Japan itself only a day or so before, and suddenly it dawned on me – why not find out for myself? I sent a couple of messages to my friends there and sure enough, they replied it wasn’t at all like how the TV news was depicting the situation, and happily this was confirmed for me even more starkly when I returned to Japan a day or so later. I’d been goaded into an unreal and unnecessary anxiety. I suppose if there’s any making sense of these things today, we all need to remain more aware of ourselves and each other. We need to be wary of making assumptions based on the information we are fed. We needn’t feel ourselves quite so helpless. We needn’t be passive receptors. We can remain connected by commonsense and mutual feeling. I have far more faith in real people than I do in what I see and hear on the TV News. Watching such reports I’m reminded of the scene in the 1984 film ‘The Killing Fields’ in which the reporter, Sydney Schanberg, is watching with increasing anxiety a TV which plays images of President Nixon making speeches and of B-52s raining bombs over Cambodia during the Vietnam conflict whilst Puccini’s Nessun Dorma plays over the sequence. 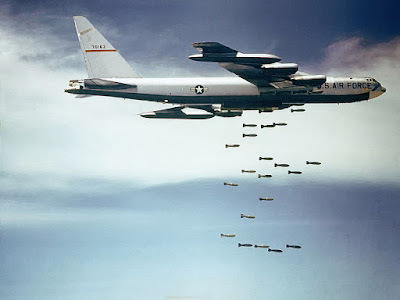 I once heard Bruce Robinson, who wrote ‘The Killing Fields’, describing B-52s as “black angels of Death” (you can hear him discussing this scene from the film in similar terms in this documentary here). And he’s right. There’s nothing more awful than the proud concept of an “iconic war machine.” Over eighty years in active service might be a technical feat to be held in suitably mechanical in awe, but shouldn’t the more amazing fact really rather be that we still rationalize the dreadful tub-thumping necessity of keeping such a monstrous idea afloat? Why are we so acculturated to war? What is it good for? … Perhaps there simply is no profit in peace, after all? War is a business. It’s not just the Global Arms trade which invests in war. All of society at different levels and to varying degrees, either overtly, tacitly, or unconsciously, contributes towards supporting it. It doesn’t much matter whether we are engaged or disconnected. War happens. It’s as straightforward as that. Perhaps we deserve the world we collectively choose to create either by our action or our apathy in our shared time together on this earth? … I’m sure that is so. But I still choose to believe in the collective good faith which we can share in one another not to let ourselves be so hoodwinked or blindly lead. Surely, not any more – Isn’t it about time we all looked a little deeper and gave such things a bit more thought?